The following is a compilation of the history of Troop 6. Dates and events are as described by newspaper articles from the times and letters and stories from the persons who lived the events. It was the summer of 1920 when newly wed Harold Holman of Idaho Falls was approached by Rev. J. C. Rollins of Trinity Methodist Episcopal Church about organizing a Boy Scout troop at the church. Sometime later, officially in November of 1920, Troop 6 came into existence. The fledgling troop was not the first in the city, indeed the number, six, indicates that it was “troop number six of Idaho Falls”. Also, it was not the first troop to be sponsored by the Methodist church. Troop 4 had been re-organized in the spring of 1920 and was a going concern. Apparently one of the reasons for the forming of Troop 6 was to alleviate the overcrowding of Troop 4. The history of Troop 4 extends back even further to before World War I, to 1913 when it, along with three other troops were formed from a boy scout troop known only as the Boy Scouts of Idaho Falls. This troop had been in existence, as an unofficial boy scout troop since late 1911. Then came the war and scouting fell by the wayside as the men who normally would lead the scouts went to war instead. Thus, Troop 4 had to go through its re-organization later. 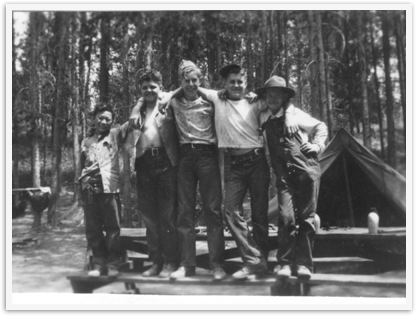 “In August of 1921 a group of us took all the Idaho Falls Boy Scouts on a two-weeks trip through Yellowstone Park. There were 110 boys, which constituted practically all of the boys in Idaho Falls that belonged to the Scout organization. We were able to secure the services of a man and his wife as cook. They had just been married and were willing to go along, do the cooking for their transportation and food for the two weeks. Mr. Clyde Brainard, who operated a trucking company, furnished 3 trucks and drivers. The merchants of the town furnished all the provisions, and each boy paid $15.00 to buy gas, oil and other unforeseeable expenses. As I remember, there were only 5 men besides the cook who went along as supervisors. There was Dr. Rollins, a Dr. West, Dr. Shattuck, Clyde Brainard and myself. If you think it was not a real job for 5 men to supervise 110 lively boys then I recommend that you try it. I lost 10 lbs. in two weeks, but I think the whole trip was a great success for there was no serious unpleasantness and the the conduct of ever-y boy was surely a great tribute to Scout training. We circled the Park and returned home to Jackson Lake country, Wilson and Swan Valley”. This outing was the annual long-term camp for Troop 4, soon to become a tradition for Troop 6. It is these long-term outings" that provide the most memories for the persons associated with scouting, particularly the boys. BOY SCOUTS HAVE BIG TIME. Troop four of the Idaho Falls Boy Scouts have returned from an eight day outing spent in the Fish Lake region about 35 miles east of Ashton. As the first number in the program for scout anniversary week Dr. Rollins, pastor of Trinity church, announces a special service for boys Sunday evening beginning at 7:30. This is not for the scouts alone, but every, boy in the community is cordially invited to attend. Several of the scout troops will attend in a body. Seats will be reserved for the troops. The scout council has been invited and Mayor Bradbury will be present. There will be special music, some of it by the scouts themselves. Scoutmaster Holman will sing a solo. Dr. Rollins will give a short address on "If I Were a Boy" and R. H. Snyder, chairman of the scout council, will speak on the aims of the movement. It will be a helpful and interesting program. Anyone who is interested in the welfare of the boys of the city is cordially invited to attend. Every boy between ten and ninety years of age is promised a seat. The mothers and sisters of the scouts and all other boys are invited. Let's go and fill the church to the roof. As a culminating celebration for boy scout week a parade of the five troops of Idaho Falls was held yesterday afternoon through the streets of the city. The different organizations made a fine showing and kept their ranks well. Paul Peterson acted as marshal for the parade. .. . The five troops were under the direction of their respective scoutmasters. They were lined up in the following order: Troop 1 of the First Ward Latter-Day Saints' church, Dr. J. W. West scoutmaster; Troop 3, sponsored by the rotary club; J. L. Hodgins, scoutmaster; Troop 4 of the Methodist Episcopal church, R. A. Barekman, scoutmaster; Troop 5 of the second ward Latter-Day Saints' church, L. G. Fox, Scoutmaster; and Troop 6 of the Methodist Episcopal church, Harold Holman, scoutmaster. Each of the troops had standard bearers carrying an American flag, and the troop insignia. We might now, think that these scouts must have been hardier than we, to hold a parade in February, but to follow it up the next week with a hike and a picnic ... sheer folly ... but for the scouts of then ... and now ... what fun! And this one from January 23 1921.. Thus it is apparent that Troop 6 was in existence and well organized by this time. The official charter of the troop from 1925 states that it is a renewal of the charter originally granted in November of 1920. The earliest charter now in our possession is for the year ending November 1922 which lists J. C. Rollins, J. G. Best, (should be J. S. Best) and N. Bronenkout as the troop committee and Harold E. Holman as scoutmaster. The years that followed saw these people helping the troop .